Having said that it is a pity that SWEA (Swedish Women Educational Association) Tampa Bay was dissolved, starting off with more than 80 members in 2008 it got a flying start. 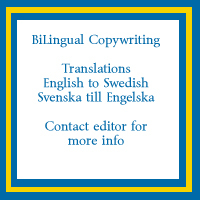 Swedish women that want to join SWEA are encouraged to join SWEA South Florida. Read more on www.swea.org/tampabay. IKEA had donated funds to SWEA to arrange for entertainment at Christmas, Midsummer and other holidays at the store it seems like those funds now went back to SWEA International's office. Hopefully IKEA in 2010 will donate to the Swedish school of Tampa Bay instead, they are local and work only for Swedish kids in Tampa Bay. My kids did not have time to attend the Swedish school this year, they have been busy with their regular schoolwork, my oldest daughter is in a dual enrollment with high school classes combined with college classes, this means long school days and a lot of homework. Luckily she got her driver's license this year. She now drives her Volvo V70 to school. I feel safe that she is driving a Volvo as her first car. I think that it is bad news that the Chinese car maker Geely wants to buy Volvo Cars from Ford. It is a shame that Sweden in the first place, did let go of one of their flagship brands and an excellent car that was actually built around safety for the driver. Not once but twice I have been in car accidents and in both cases I have told from people that took care of the wrecks that it was the fact that I was driving a Volvo that saved my life. Sweden is Volvo, Volvo is Sweden. Let us hope there is still a chance that Volvo can come back home and continue a proud tradition of Swedish car engineering. For me it was one of the top ten bad news of the year that Volvo might end up in China. My youngest daughter was selected for the gifted classes to begin in January and she will also partipate in a global learning project between the gifted group here in Florida and a school in Stockholm. It is great that Florida schools participate in those global exchange projects to expand the knowledge about the world for Floridian kids. The kids that are priviledged to participate in this exchange program in Florida schools will belong to the chosen few that will not mix up Sweden with Switzerland. My youngest worked hard to get to the top of her school and she was rewarded not only by the gifted class placement but also being the first Swede ever to be elected citizen of the month in Dade City in October this year. I like the way American schools encourage bright and hard working students and indentify and reward good students from early on. My last memory from the Swedish school my kids attended was when my oldest daughter had to sit outside the classroom with a headset to be able to concentrate on her work as the kids in her class where so loud and rowdy and the burned- out teacher had given up. Florida might not be the best state or place in the world for education but for our family it has been a good change of schools. to have developed a technology with the potential to wipe out the established wireless telecommunications industry and provide free, or almost free, telephony for everyone. Several Swedes are on the board of the Sarasota company and their claims have been questioned by many. They seem to have been able to attract some money for their project but lately it looks like the company has lost its attraction to investors. Looks now that this company will not be the new Skype but a crashed hype. Some called it a scam from the beginning, and if so, this company was part of a trend in 2009 when a lot of scammers got caught, Bernie Madoff was the most famous and his scam shook the Florida east coast where he had found a lot of his victims. Madoff and others with the same business idea would probably not have been caught if it hadn't been for the crash of the economy, at least something good that came out of the bad economy. The after shock of the fraud schemes also made it painfully clear the low level of consumer protection in the USA. This is just another example of the predatory market economy that has been allowed flourish in the USA. Anyone that thinks that anything but money controls this country is blinded and deafened by propaganda or idealism. Was Tiger blinded by a golf club when he casued most famous car crash of 2009? The golf icon and tycoon, drove his Cadillac Escalade into a tree near his house in Orlando. His Swedish wife has been accused of chasing her famous husband with a golf club, and now that we all know what Tiger was up to, many of us understand the wrath of his wife. Tiger and Elin Woods cannot complain over money problems unlike many Americans. It has been a tough year for many families and companies in Florida and spending has been tight. There have been very few good news about the economy in Florida, a state that has relied on pure growth to maintain its welfare. Hopefully this will be a good lesson for Florida to realise that a more sustainable economy is built on a well educated population that can grow the economy in better ways than building houses and theme parks. Luckily, we did not see much of hurricanes and bad storms this year, it has been very calm where we live, some good news amidst all the gloom and doom of 2009. Let us hope for a brighter and more prosperous 2010.